As promised, more on the glory that was our vacation ... has it really been two weeks we've been back? Tragic - time to plan for the next trip, eh? Bruges ended up being an EXCELLENT choice for a day-trip from Paris. Getting there was simple - in theory, at least. The Thalys fast train system travels to and from a variety of major European destinations, in our case, Paris to Brussels. From there, we took the local Belgian train to Bruges. (I think they were repairing the Thalys line that goes from Paris to Bruges, so you may be able to catch that in the future.) The tricky part, as we realized, is finding which station in Paris to depart from. As good reporting bloggers do, I decided to start off at the absolutely WRONG station in order to recount to you that exciting tale. No, actually I'll blame this one on Matt (I'm retiring The Boy, unless you think he should now be The Fiancé) not knowing French and both of us being in a post-engagement haze. See it sparkling there? Sigh. 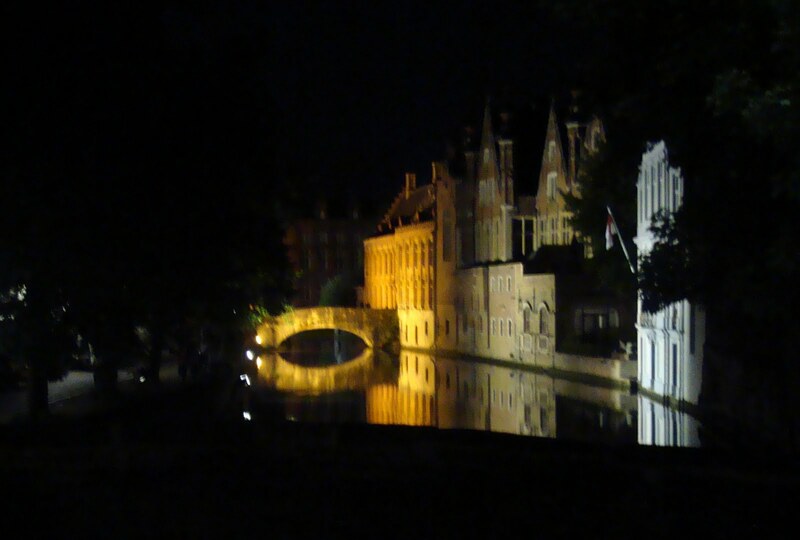 We got to Bruge just as dusk was settling in and enjoyed a meandering stroll to our B&B. And let me tell you about that. After some grueling research, we decided upon the Cote Canal Bed and Breakfast. And let me just say - BEST B&B EVER! If you've never been to a B&B, do yourself a favor and skip the Marriotts and Hyatts on your next trip. For service, character and an opportunity to meet the locals, you can't beat staying in a B&B. And this place is a destination on it's own. 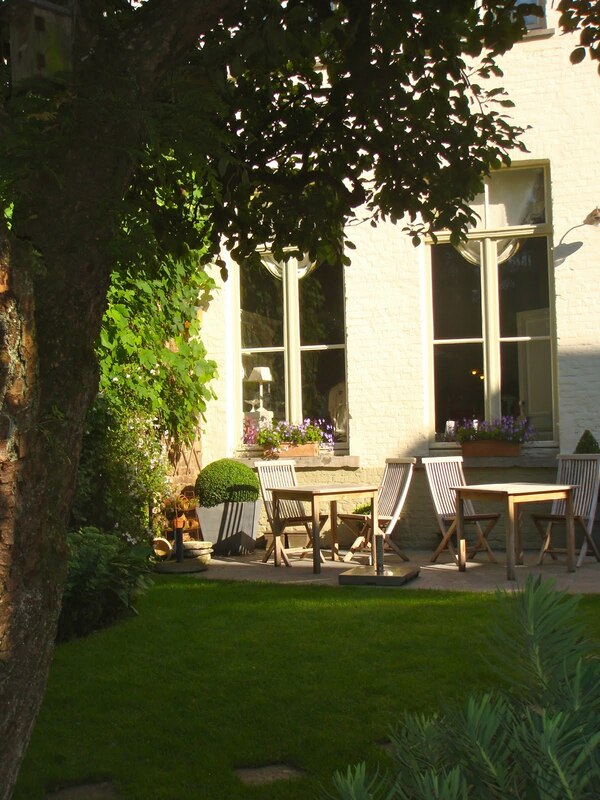 It's been in Caroline's family for 5 generations and sits right on the canal with a breathtaking garden for having your (homemade) breakfast. Idyllic. 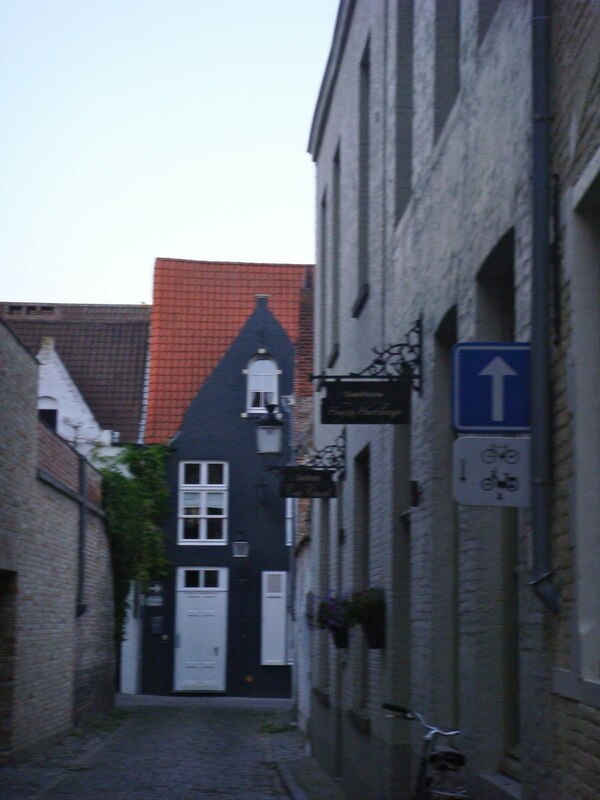 Bruges is a medieval city, full of history down each cobblestoned lane. It was great fun to walk around, but even better is getting around like the locals do - by bike! On our first, and sadly, only day in Bruges, we rented matching bikes for an excursion about town. Downtown, full of horse carriages and tourists, is a little tricky, but once you get outside of the city center into the quiet neighborhoods and parks, it's a wonderful ride. And we saw windmills! How Belgian is that?? The scenery was beautiful. The canals are home to TONS of swans - can't blame them, I'd live there too! This is the Beguinage, a religious community of lay women dating to the 12th century. It was incredibly peaceful and quiet, as all visitors are asked to remain silent. Lunch was a great meal - chicken for Matt and a huge bucket o' mussels for me. And beer. Always beer. We watched these cute kids splash in the horse fountain while we enjoyed lunch. In short, Bruges is a must see. I cannot wait to go back, stay in the Cote de Canal with Caroline, and just bask in the city's history and calm. Be advised - there are some hugely touristy areas, full of people from all over. But, somehow, this really didn't take away from the charm of the place for me. It's easy enough to jump on a bike and head to a quieter area where the Belgians live and work. I'd highly recommend Bruges as a destination for couples or families (there were lots of kids touring around). The Belgians are so friendly - so if you need a break from the more acerbic French, this is a great place to escape! Oh, so beautiful! Are you thinking of Bruges for your honeymoon? Stick with Matt, going with the Fiance would mean another switch to the Husband later on (but please not the Hubby). Honestly, I'm a little afraid to put it on the web - it's too pretty! !